Los Angeles-based musician Ashli Christoval, aka Jazzy Ash, brings us the first release from her forthcoming album, Bon Voyage. “Heebie Jeebies” was originally performed by Louis Armstrong, one of Ash’s idols. 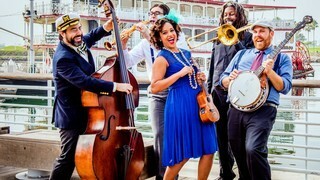 Infused with her swinging New Orleans style, Ash revitalizes the ~90 year old song while honoring it’s original arrangement with the same big, brassy sounds. It’s delightful and I imagine Louis would be proud! The video was filmed in The French Quarter of New Orleans. The black and white film sets the perfect scene for a rendition of such a classic song. Great stuff, and I am excited to hear more of what’s to come! Support Jazzy Ash through her PledgeMusic Campaign! 4 days left and 97% funded!